Sea-Scope is a marine environmental consultancy offering expert, high quality and robust marine and coastal ecological services to a range of clients, both in the UK and worldwide. [September 2017] As part of the Darwin Initiative project (in which Sea-Scope has been a joint partner along with Dundee University, Kings College London and the Zoological Society of London), two display boards have been produced for Pitcairn Island as part of an incentive to enhance the tourist experience on the island. 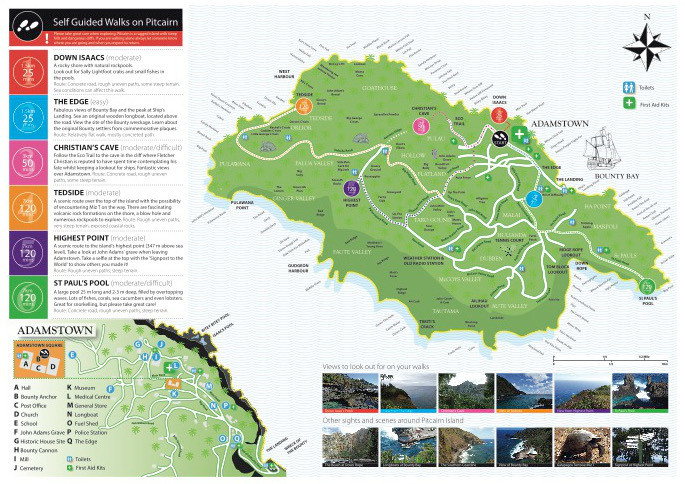 Sea-Scope has helped with the content of both: one on walking trails on Pitcairn and the other on the marine environment of the Pitcairn Islands. [June 2017] A new marine management plan has been published for the Lundy Marine Protected Area. The plan was originally written by the island’s former warden Rebecca McDonald and has now been considerably revised by Sea-Scope’s Robert Irving, who has acted as secretary to the MPA’s Advisory Group for the past 30 years. A pdf copy of the plan is available here. in Scotland (MASTS) and held at St Andrews University. It provided a rare opportunity to catch up with Michele Christian, Head of Environmental Conservation and Natural Resources Department of Pitcairn Island, who has been in the UK for a couple of months. The photo to the right shows some of the workshop participants (from L): Prof. Terry Dawson (Kings College London), Michele Christian (Pitcairn Island), Prof. David Paterson (St Andrews University), Robert Irving (Sea-Scope) & Prof. Murray Roberts (Edinburgh University). [14 September 2016] At last! The waters surrounding the Pitcairn Islands have officially been declared a highly protected Marine Protected Area by the UK Government, making the area the second largest MPA in the world. Sea-Scope has been involved with projects in the islands since 1991 and over the past 5 years has been working closely with colleagues at Pew Environment Group’s Global Ocean Legacy project to ensure the establishment of the MPA. This designation was announced at the same time as a number of other initiatives by the UK Government as part of its ‘Blue Belt’ initiative. See here for the official statement and here for the supportive reaction. [August 2016] Redfern Natural History Publications publishes Stewart MacPherson’s book Britain’s Treasure Islands – a journey to the UK’s Overseas Territories, to accompany the BBC TV series of the same name. The book describes the amazing wildlife and peoples of the UK’s 14 Overseas Territories, scattered throughout the world and each visited by the author. Robert Irving helped to edit the book and also co-authored the chapter on the Pitcairn Islands. Further details available here. along with his Darwin Initiative colleagues Prof. Terry Dawson and Dr Heath er Koldewey, to hear an update on the UK Government’s ‘Blue Belt’ initiative in the Overseas Territories. [May 2016] A new book Marine World – A Natural History of Ocean Life, by Frances Dipper and published by Wild Nature Press (RRP £45), is launched to much fanfare. Sea-Scope’s Robert Irving contributed by writing the chapters on Marine Mammals. The Foreword is by Mark Carwardine and states: “All you could possibly want to know about everything, from El Nino to elasmobranchs and waves to whales, is crammed into Frances Dipper’s irresistible book. What an outstanding achievement.” Further details can be found here. 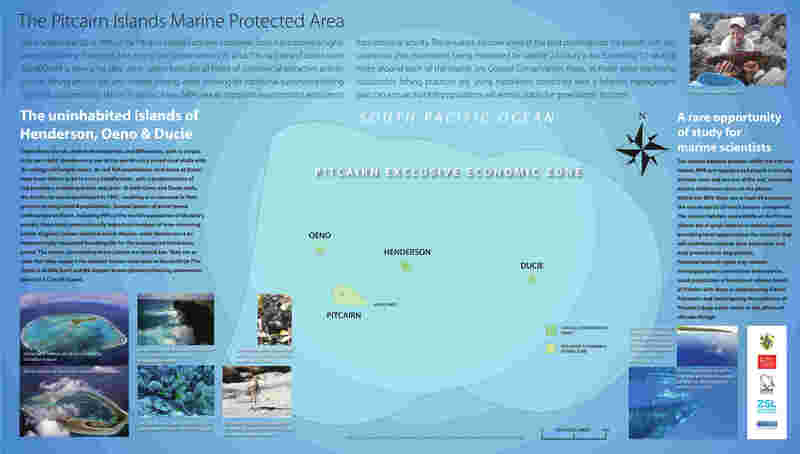 [18 March 2015] On the day that the UK government’s budget spending for the forthcoming year is announced with much fanfare, the intention to designate a Marine Protected Area around the Pitcairn Islands is also announced. Hurrah! At last, after 4 years of Sea-Scope helping to promote the prospect of an MPA around the islands by supporting the work of Pew’s Global Ocean Legacy campaign, our efforts have paid off. The Pitcairn Islands MPA now becomes the largest in the world. [See articles written in the Washington Post, The Ecologist and by the Marine Conservation Society]. Robert Irving was invited by the Great British Oceans campaign to add his name to the list of signatories supporting the MPA initiative. Congratulations to all involved, especially to the Pitcairn islanders themselves – let’s hope the other OTs of Ascension and the South Sandwich Islands aren’t far behind. [February 2015] Robert Irving represents Sea-Scope at a second ‘promotional’ meeting of establishing MPAs in three of the UK’s Overseas Territories (including Pitcairn), at the House of Commons, London. There is now considerable momentum and backing to get at least one of these MPAs declared before the election in May. See www.greatbritishoceans.org for further info. [December 2014] Robert Irving visits Pitcairn again for 10 days as part of the Darwin Initiative project. Discussions are held with the Fisheries Officer, the Tourism Co-ordinator, the Museum manager, the island’s Mayor… and the remaining 45 people on the island too! This visit marks the start of the 2nd year of the 3-year project, and was Robert’s 5th visit to the island since 1991. [September 2014] The Darwin Initiative project team (Robert Irving of Sea-Scope, Dr Heather Koldewey of ZSL and Prof. Terry Dawson of Dundee University) attend the launch of MPAs in the UK’s Overseas Territories at the Houses of Parliament, London, which featured presentations on the Pitcairn Islands, Ascension Island, and South Georgia and the South Sandwich Islands, all of which are being proposed as Highly Protected Marine Reserves. [June 2014] Robert Irving visits Pitcairn Island, South Pacific for an 18 day stay, as part of the Darwin Initiative project A sustainable marine and fisheries management plan for the Pitcairn Islands. He was accompanied by Dr Tom B. Letessier from the University of Western Australia and Henry Duffy, an MSc student from Imperial College, London. Further news of his trip can be viewed here. 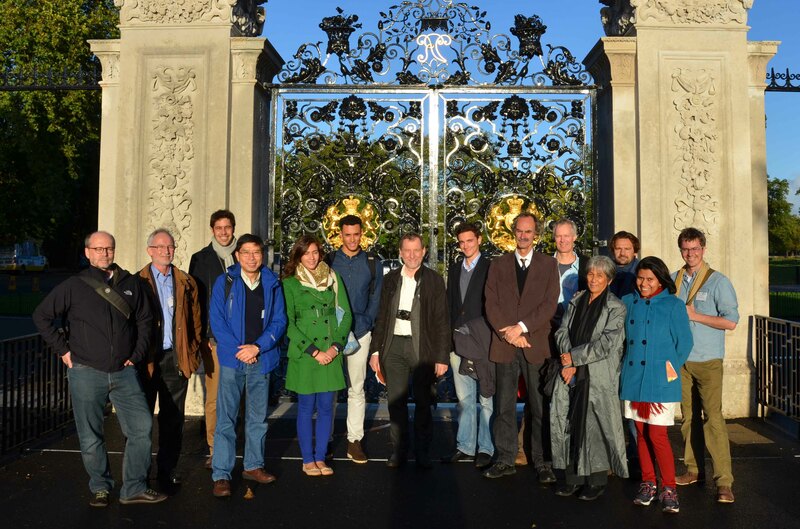 Robert Irving, principal consultant at Sea-Scope, was invited to give a joint presentation (with Jan-Willem van Bochove of UNEP-WCMC, Cambridge) on the The Abu Dhabi Blue Carbon Demonstration Project, at the inaugural meeting of the IUCN’s Mangrove Specialist Group at the Zoological Society of London. Sea-Scope has been sub-contracted by the NatureBureau Ltd. to assist with developing shallow sublittoral rock monitoring protocols and indicators for the UK implementation of the EU’s Marine Strategy Framework Directive on behalf of the Joint Nature Conservation Committee. A partnership of the University of Dundee (Professor Terry Dawson), the Zoological Society of London (Dr Heather Koldewey) and Sea-Scope Marine Environmental Consultants (Robert Irving) has recently won a 3-year project grant entitled A sustainable marine and fisheries management plan for the Pitcairn Islands, as announced here. Terry Dawson & Heather Koldewey (Dec. 2013) undertook the first site visit to Pitcairn under the auspices of this project, with Heather’s blog of her visit being able to be seen here.